One of the most basic and common operations in Excel is creating a new workbook. You've probably created a countless number of new workbooks yourself. Create a new workbook based on a particular template. Create a workbook with a certain amount and type of sheets. Create a new workbook and save it under a particular name. Copy or move one or several worksheets to a new workbook. Copy a range of cells to a new workbook. If that's the case, then this Excel VBA Tutorial should help you. In this blog post, I focus on how you can easily create new Excel workbooks with VBA. In the first section of this Tutorial, I introduce some of the most relevant VBA constructs (with a focus on the Workbooks.Add method) that can help you to quickly craft a macro that creates a new workbook. In the second section, I provide a step-by-step explanation of 16 practical macro code examples that you can easily adjust and start using today. Use the following Table of Contents to navigate to the section that interests you the most. This Excel VBA Create New Workbook Tutorial is accompanied by an Excel workbook containing the data and macros I use in the examples below. You can get immediate free access to this example workbook by subscribing to the Power Spreadsheets Newsletter. You use the Workbooks.Add method to create a new Excel workbook. The newly created workbook becomes the new active workbook. Therefore, the value that Workbooks.Add returns is a Workbook object representing that newly created workbook. Template: Optional parameter. It allows you to specify how Excel creates the new workbook. Template is the only (optional) argument of Workbooks.Add. Create a new workbook with the default number of blank sheets. This is the default value of Template. Therefore, Excel does this whenever you omit the parameter. Create a new workbook with a single sheet of a certain type. As I explain below, you can choose this option by using the xlWBATemplate constants. Use a particular file as a template. You determine the template Excel uses by specifying the name of the relevant file. If you want to create a new workbook based on an Excel template, you can use the Workbooks.Open method and set the Editable parameter to False. I introduce the Workbooks.Open method further below. Is determined by the Application.SheetsInNewWorkbook property. I provide further information about this property further below. Appears (and you can modify it from) within the General tab of the Excel Options dialog. 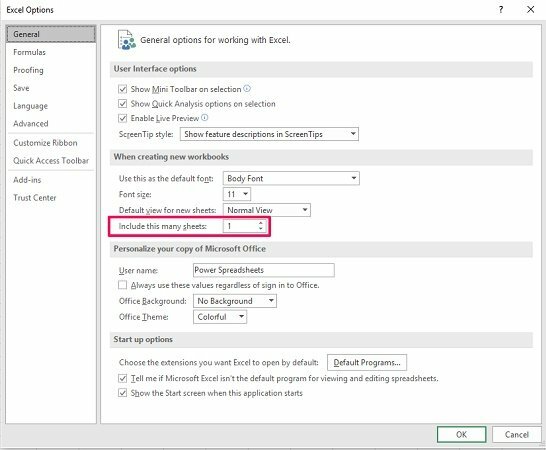 Specify an existing Excel file as a string: The file you specify is used as a template for the new workbook. When specifying the template that Excel uses, include the full path of the file. xlWBATExcel4MacroSheet (3): Version 4 international macro. xlWBATExcel4IntlMacroSheet (4): Version 4 macro. The Workbooks.Open method is the VBA construct you generally use to open workbooks while working with Visual Basic for Applications. I provide a thorough explanation of Workbooks.Open and its parameters (including Editable) in this VBA tutorial about opening a workbook. Please check out that blog post if you're interested in learning more about this particular method. For purposes of this tutorial, it's enough for you to know how to use the Open method to create a new workbook based on an Excel template. FileName:=yourTemplateName: Filename parameter. “yourTemplateName” is the filename of the Excel template you want to use. Editable:=False: Editable parameter set to False. When Editable is False, Excel creates a new workbook based on the template you specify with the FileName parameter. I don't cover the other 13 parameters of Workbooks.Open in this blog post. However, you may find some of them useful when creating a new workbook based on a template. If you're interested in reading more about these parameters, please refer to my tutorial about the topic (to which I link to above). Application.SheetsInNewWorkbook is the VBA property that determines how many sheets newly created workbooks have. It's the equivalent of the Include this many sheets setting within the General tab of the Excel Options dialog. The SheetsInNewWorkbook property is read/write. Therefore, you can use it to specify the number of sheets that is inserted in a workbook you create with the Workbooks.Add method. I provide a practical macro code example (sample #5) further below. SheetsInNewWorkbook is a property of the Excel Application object. Therefore, any setting modifications you make with VBA apply in general to other newly created workbooks. The functionality provided by SheetsInNewWorkbook is relatively limited. In fact, you can only specify the number of sheets that the newly created workbook has. You can usually handle item #1 above by ensuring that your VBA Sub procedures return SheetsInNewWorkbook to the same setting that applied prior to the macro being executed. Macro example #5 below shows an example of how you can do this. After the sheet is created, Sheets.Add activates the new sheet. Before: Optional argument. The (existing) sheet before which you want to add the newly created sheet. After: Optional parameter. The (existing) sheet after which you want the new sheet to be inserted. Count: Optional parameter. Allows you to specify the number of sheets that VBA adds. The default value of Count (applies if you omit the argument) is 1.
xlWorksheet is the default value. Therefore, this is the type of sheet that Excel adds if you omit the Type parameter. xlExcel4MacroSheet (3): Excel version 4 macro sheet. xlExcel4IntlMacroSheet (4): Excel version 4 international macro sheet. The default location of the newly created sheet is before the active sheet. Therefore, this applies if you omit both the Before and After parameters above. The following methods are, to a certain extent, substantially similar to the Sheets.Add method above. Sheets.Add works with the Sheets object. This is the collection of all sheets within the relevant workbook. Worksheets.Add works with the Worksheets object. That is, the collection of all worksheets within the appropriate workbook. Charts.Add makes reference to the Charts collection. This is the collection of all chart sheets. DialogSheets.Add works with the collection of dialog sheets. Excel4MacroSheets.Add makes reference to the collection of Excel 4.0 macro sheets in the workbook. Excel4IntlMacroSheets.Add works with the collection of Excel 4.0 international macro sheets. From a broad perspective, most of the parameters of the Add method act in a similar manner regardless of the object you refer to. Therefore, the comments I make above regarding the Before, After and Count arguments of the Sheets.Add method also apply to this section. Worksheets.Add: The default value of Type is xlWorksheet. The method fails if you set Type to xlChart or xlDialogSheet. Charts.Add: In this case, the default (and only acceptable) value is xlChart. In other words, the method fails with xlWorksheet, xlExcel4MacroSheet, xlExcel4IntlMacroSheet and xlDialogsheet. DialogSheets.Add: The default value is xlDialogSheet. This is also the only acceptable value. The method doesn't work with xlWorksheet, xlChart, xlExcel4MacroSheet or xlExcel4IntlMacroSheet. Excel4MacroSheets.Add: Default value is xlExcel4MacroSheet. The method fails if you try to use xlChart. Excel4IntlMacroSheets.Add: The default value of Type is xlExcel4IntlMacroSheet. Similar to the Excel4MacroSheets.Add method, it fails with xlChart. From a general perspective, the Workbooks.SaveAs method allows you to save a workbook file. As I explain in this tutorial, you can use the SaveAs method to create a new workbook with a particular filename. I provide a very detailed explanation about Workbook.SaveAs method in my blog post about saving Excel workbooks with VBA, which you can find in the Archives. Please refer to that post in order to learn more about this method and all the possibilities it provides. For our purposes, “workbookName” is the name of the workbook you're creating. FileFormat: The file format of the newly created/saved workbook. Password: Protection password of the new workbook. Please read my blog post about this topic (I link to the Archives above) to learn more about these other arguments. Those methods are, at their basic level, substantially similar. Sheet (Sheet.Copy) or Sheets collection (Sheets.Copy). Worksheet (Worksheet.Copy) or Worksheets collection (Worksheets.Copy). Chart (Chart.Copy) or Charts collection (Charts.Copy). Dialog Sheet (DialogSheet.Copy) or Dialog Sheets collection (DialogSheets.Copy). Excel 4.0 macro sheet (Excel4MacroSheet.Copy) or Excel 4.0 macro sheets collection (Excel4MacroSheets.Copy). Excel 4.0 international macro sheet (Excel4IntlMacroSheet.Copy) or Excel 4.0 international macro sheets collection (Excel4IntlMacroSheets.Copy). The Sheet.Copy and Sheets.Copy methods allow you to copy a sheet or a collection of sheets to another location. expression: Sheet or Sheets object. Before: Optional parameter. The sheet before which you want to copied sheet(s) to be. After: Optional argument. The sheet after which you want to copy the sheet(s). If you specify Before, don't use After. If you specify After, don't use Before. The Move method is, to a certain extent, similar to the Copy method I describe in the previous section. When you manually copy or move a sheet, you use the Move or Copy dialog box. This dialog box allows you to specify whether you want to create a copy or not. If you choose to create a copy, you're using the equivalent of the Copy method. Otherwise, you're working with the equivalent of the Move method. Sheet (Sheet.Move) or Sheets collection (Sheets.Move). Worksheet (Worksheet.Move) or Worksheets collection (Worksheets.Move). Chart (Chart.Move) or Charts collection (Charts.Move). Dialog Sheet (DialogSheet.Move) or Dialog Sheets collection (DialogSheets.Move). Excel 4.0 macro sheet (Excel4MacroSheet.Move) or Excel 4.0 macro sheets collection (Excel4MacroSheets.Move). Excel 4.0 international macro sheet (Excel4IntlMacroSheet.Move) or Excel 4.0 international macro sheets collection (Excel4IntlMacroSheets.Move). You can use the Sheet.Move or Sheets.Move methods to move sheet(s) to another location. Before: Optional parameter. Sheet before which you want to place the moved sheet(s). After: Optional argument. Sheet after which the moved sheet(s) is(are) located. Before and After are mutually exclusive. Therefore, choose to use one or the other (not both). When applying the Move method to a whole collection, bear in mind that an Excel workbook generally must keep at least 1 visible sheet. If execution of your macro results in a workbook not having any visible sheets, you usually get a run-time error. The following methods are substantially similar to Sheet.Move and Sheets.Move (which I describe above). Therefore, my general comments above are also applicable. An array is a group of elements. The elements have the same name and type. The elements are sequentially indexed. Therefore, each element has a unique identifying index number. I cover the topic of VBA arrays in detail here. Please refer to that tutorial in order to learn more about arrays and how they can help you when working with Visual Basic for Applications. In the context of this tutorial, arrays help us manipulate several worksheets at once. More precisely, as I show in examples #10 and #13 below, you can use an array to copy or move several worksheets to a new workbook. For these purposes, “argumentList” represents the list of values you want to assign to the array elements. You separate the different arguments using a comma (,). Explaining each of these constructs exceeds the scope of this VBA tutorial. However, in macro examples #15 and #16 below, I provide VBA code examples that use the Range.Copy method to copy a range to a newly created workbook. You can use the information and examples I provide in the blog post about copying and pasting with VBA (follow the link I provide above) for purposes of easily using the other VBA constructs I mention above. The following sections provide you with 16 different practical macro examples that you can adjust and use to create a new workbook. All of the macro code samples below rely, mostly, on the VBA constructs I introduce and describe in the first part of this tutorial above. This simply makes reference to the Workbooks.Add method. It uses this method for purposes of adding a new workbook to the Workbooks collection. In other words, the statement simply creates a new workbook. Even though each of the other macro examples (below) targets a different situation, several of them rely on this basic statement (or a close derivative). When I execute the sample macro above, Excel simply creates a new workbook with (i) the default name (Book1 in this case), and (ii) the default number of blank worksheets (1 in this example). For these purposes, “Filename” is the name of the Excel file you're using as template for the new workbook. The following macro example (Create_New_Workbook_With_Template_1) uses the Workbooks.Add method and the Template parameter. For purposes of this example, I use this 2016 Olympics Dashboard created by Excel Template authority Dinesh Natarajan Mohan from indzara.com. The result I obtain when executing this macro is a new Excel workbook that uses Dinesh's beautiful dashboard as a template. Within this structure, “TemplateFilename” makes reference to the template you want to use. For these purposes, “new#” is the number of worksheets you want the newly created workbook to have. Modify the number of worksheets that newly created workbooks have. This structure I provide is quite basic. Therefore, it simply modifies the setting that determines how many worksheets are included in a new workbook. The following sample macro (Create_New_Workbook_Several_Worksheets_1) relies on the structure above to create a new workbook with 3 worksheets. However, it goes one step further and, after creating the workbook, resets the Application.SheetsInNewWorkbook property to its default value. Reads the current setting of the Application.SheetsInNewWorkbook property (Application.SheetsInNewWorkbook). Stores the setting obtained in step #1 within a variable (currentSheetsSetting = ). Sets the Application.SheetsInNewWorkbook property to 3 (Application.SheetsInNewWorkbook = 3). Therefore, newly created workbooks have 3 sheets. Creates a new workbook (Workbooks.Add). Restores the original setting of Application.SheetsInNewWorkbook (Application.SheetsInNewWorkbook = currentSheetsSetting). The following screenshot shows the workbook that Excel creates when I execute this macro sample. Notice that, as expected, it has 3 sheets. An alternative to relying on the Application.SheetsInNewWorkbook property is to work with the Sheets.Add, Worksheets.Add, Charts.Add or DialogSheets.Add methods that I explain above. These methods have some advantages (including more flexibility) over relying on the Application.SheetsInNewWorkbook property. For these purposes, “#” is the number of additional sheets you want to add. The workbook created by Workbooks.Add comes (already) with the number of worksheets determined by the Application.SheetsInNewWorkbook property (usually 1). Adds a certain number of worksheets (#) to the newly created workbook. The particular macro structure above works with the Worksheets.Add method. You can, however, also work with the Sheets.Add, Charts.Add or DialogSheets.Add methods by using a similar syntax. For purposes of understanding the differences between each of these methods (and how to use them), please refer to the appropriate section above. The following macro example (Create_New_Workbook_Several_Worksheets_2) uses the structure above to create a new workbook and (immediately add 2 additional worksheets. The result is a newly created workbook with 3 worksheets. The following image shows the workbook that Excel creates when I execute this macro. Notice that, just as in the previous example, the newly created workbook has 3 worksheets. Adds a new chart sheet to the newly created workbook. The newly created workbook looks as follows. Notice that, as expected, the workbook has 1 worksheets and 1 chart sheet. If Template is xlWBATWorksheet: “Item” is “Sheet”. Therefore, workbooks are named Sheet1, Sheet2, Sheet3, etc. If Template is xlWBATChart: “Item” is replaced by “Chart”. New workbooks have names such as Chart1, Chart2, Chart3, etc. If Template is xlWBATExcel4MacroSheet or xlWBATExcel4IntlMacroSheet: “Item” is “Macro”. The names of new workbooks are Macro1, Macro2, Macro3, and so on. If Template specifies an Excel file: “Item” is replaced by the name of the Excel file you specify. As a consequence, new workbooks have the name of Template followed by the appropriate number (TemplateName1, TemplateName2, TemplateName3, and so on). Excel applies this same rule if you create a new workbook by using the Workbooks.Open method with an Excel template. I show a practical example of a macro that does this in sample #3 above. “workbookName” is the name you want to assign to the newly created workbook. Create a new workbook (Workbooks.Add). Save the workbook using the appropriate name (.SaveAs Filename:=workbookName). The following macro example (Create_New_Workbook_With_Name) uses the structure above to create a new workbook named “Excel VBA Create New Workbook With Name”. The following screenshot shows the results I get when executing this macro. Notice that, as expected, the workbook is indeed named “Excel VBA Create New Workbook With Name”. The Copy method allows you to copy sheets to a new workbook. In this section, I show how you can use this method copy one or several worksheets to a new workbook. I explain these methods above. The following macro example (Copy_Sheet_To_New_Workbook) uses the statement form above in order to copy a worksheet (Copy1) to a new workbook. The following image shows the results I obtain when running the macro. Notice that the newly created workbook, indeed, contains the copied worksheet (Copy1). For these purposes, “Worksheet1” through “Worksheet#” are the worksheets you want to copy. The following screenshot shows the workbook Excel creates when I execute this macro. Notice that, as expected, the worksheets I specified in the macro above (Copy1 through Copy5) are included in the new workbook. In this case, the newly created workbook contains all the worksheets within the applicable workbook. The following macro example (Copy_All_Sheets_To_New_Workbook) implements the statement above. The following image shows the workbook Excel creates when I execute this macro. The newly created workbook contains copies of all the worksheets within the relevant workbook (Copy1 to Copy5, Move1 to Move5 and Range). You can use the logic behind the macros examples that copy worksheets to a new workbook for purposes of moving worksheets to a new workbook. For these purposes, you use the Move method. Use the following statement syntax to move a worksheet to a new workbook. The moved worksheet is the only within the newly created workbook. The following screenshot shows the newly created workbook. Notice that the workbook contains the moved worksheet (Move1). The workbook that Excel creates when I execute this macro looks as follows. Notice that the workbook contains the 5 worksheets (Move1 to Move5) that I specified in the code above. The following image shows the results I get when executing this macro. All worksheets in the applicable workbook (Copy1 to Copy5, Move1 to Move5 and Range) are moved to a new workbook. The only remaining sheet in the source workbook is an empty chart sheet. The existence of this chart sheet in the source workbook allows the workbook to comply with the requirement of having at least 1 visible sheet after all worksheets are moved to a new workbook. If this chart sheet doesn't exist, execution of the Move_All_Worksheets_To_New_Workbook causes a run-time error. As I explain above, there are several ways in which you can copy and paste ranges using VBA. In this section, I provide a code example that relies on the Range.Copy method to copy a range to a newly created workbook. Please refer to the relevant section above for purposes of reading about the other VBA constructs you can use for these purposes. Workbook.Worksheet.SourceRange: Fully-qualified reference to the range you want to copy. DestinationRange: Range where you want Excel to paste the range. Copies cells B5 to C20 of the worksheet named “Range”. This cells simply contain some randomly generated numbers. Pastes the cells it copied in step #1 above in cells B5 to C20 of the first worksheet of a newly created workbook. The following image shows the results I get when running this macro. The range is copied to cells B5 to C20 of the newly created workbook. The structure I use in the macro example above, however, may not work properly with a few of the VBA constructs that you can use to copy ranges. A more flexible alternative involves assigning the newly created workbook to an object variable. After this has occurred, you can simply refer to the object variable. The following basic syntax shows how you can (i) create a new workbook, (ii) assign it to an object variable, and (iii) copy a range to that new workbook. Copies cells B5 to C20 of the worksheet named “Range”. Pastes those copied cells in cells B5 to C20 of the first worksheet of a newly created workbook. The following screenshot shows the results I obtain when executing the macro. Notice that they're substantially the same as those obtained with the previous macro example #15. Creating a new Excel workbook is one of the most essential and common activities in Excel. Knowing how to use Visual Basic for Applications for purposes of creating new workbooks allows you to automate several processes and become an even more efficient Excel user. After reading this Excel VBA Tutorial, you have enough knowledge to start or continue developing a wide array of VBA applications that create new Excel workbooks. In the first section of this blog post, you read about several VBA constructs that are commonly used when creating new workbooks. In that section, you focused on the Workbooks.Add method. This is the most basic and commonly used construct used within macros that create new workbooks. In that first section, you also read about other VBA constructs that you can use to either (i) add functionality and flexibility to the procedures that create new workbooks or, (ii) create new workbooks without specifically using the Workbooks.Add method. Use a template to create a new workbook. Create workbooks with different types of sheets. Create workbooks with a different number of sheets. Create a new workbook with a particular name. Create or move sheets to a new workbook.